You ever find yourself working on a computer only to find that the computer wants to work less than you do? Most of us have. 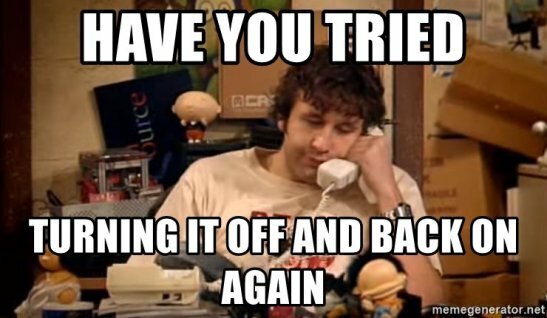 What’s the first thing you do to fix it? Other than bashing the keyboard and maybe muttering obscenities under your breath, I mean. Answer: You turn it off and then you turn it on again. Sometimes people are like that too. We get so worked up about so many little things in our lives that seem so important, and they all build up to a big breakdown mentally. It doesn’t have to be super dramatic like a freak out, just a failure to cope as well as normal, or an inability to put things in perspective and feel comfortable with going on with life as usual. Emotionally, I think just as many of us have had to deal with this as we’ve had to deal with broken machines. I liken people to computers in this instance not because they’re as mechanically rigid but due to a similarity in their fixes. Just like machines, people need to be rebooted every now and then. You obviously can’t literally shut a person off and then put them back online because that would be deadly, (and I take no responsibility for anyone who dies trying it) but you can reset your own frame of mind and that’s what’s important here. Remember to take a day to yourself every now and then and really consider what is eating at you. Where is the breakdown occurring, why, and what can you do about it? Set aside some time to ponder this, make way for a resolution, and then take the rest of the day to just be. Relax and feel at one with yourself. It sounds cheesy but it can make a big difference and we could all use it occasionally. Now if you’ll excuse me, I need to go find my own power button.